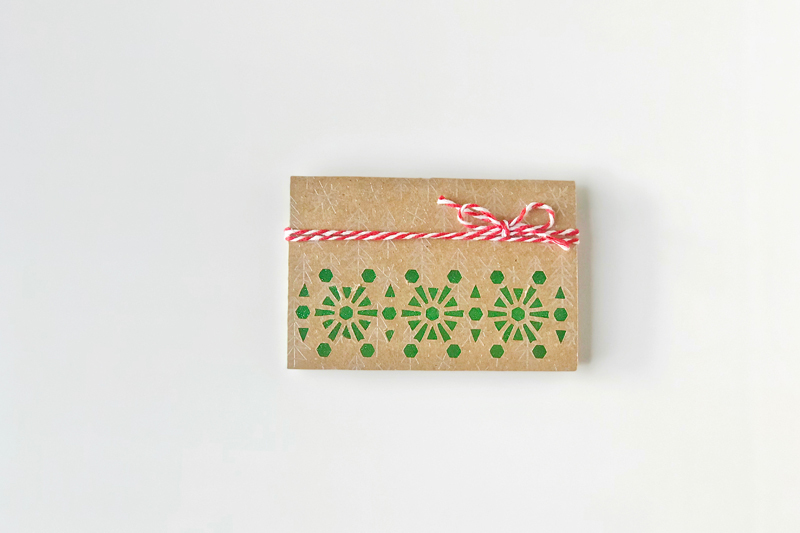 Welcome to week 3 of our DIY Holiday Gift Giving series. 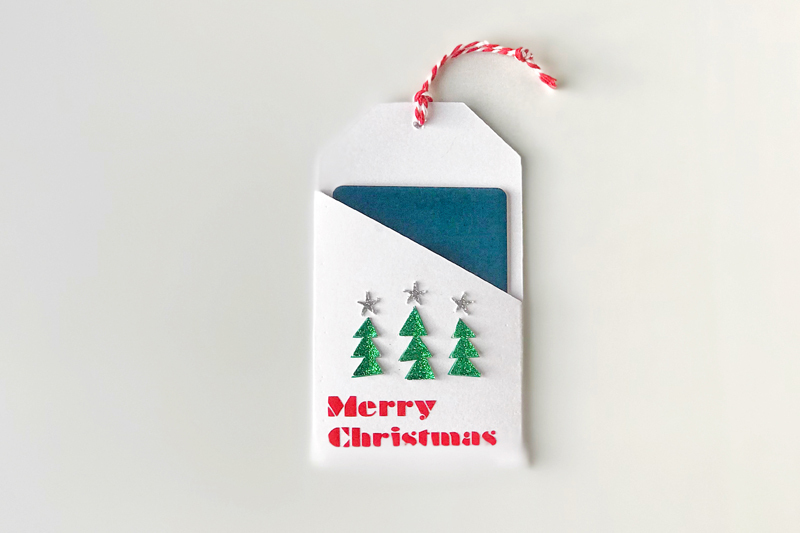 This week we’re excited to be talking about dressing up your gift cards. During the holidays it’s inevitable that someone on your list will be impossible to buy for which makes a gift card the perfect gift. We’re here to help you dress up that gift card to make it more fun to give! Before ordering your supplies for this week's projects check your stash from the last couple weeks and make sure you use our discount code 8WEEKDIY to save an additional 10% on your total purchase from shop.cricut.com (must be a $50 or more purchase and excludes machines and Cricut Access). Let’s get right into these fun projects. All of these projects can be created with the Maker or the Explore machines. Scoring Wheels in the Maker make folding a breeze, especially with the thicker materials like Kraftboard. If you don’t have the Maker you can use the Scoring Stylus just be careful you don’t crack your papers along the fold. If you’re looking for tips on assembly you’re in luck! We did a full Facebook Live showing you how to assemble many of them. 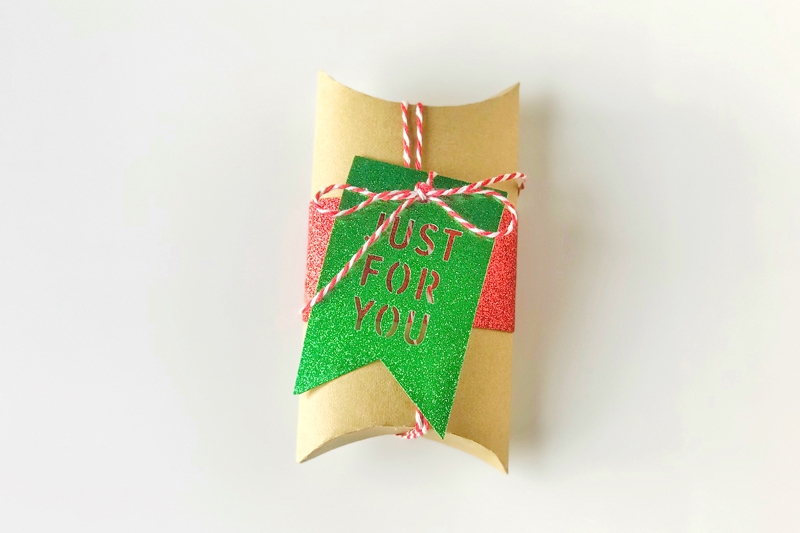 Using kraft colored cardstock, red and white baker’s twine, rich red glitter cardstock, and green sparkle paper you can create the perfect little pillow box to hold your gift card. We are completely in love with our new Foil Embossed Cardstock. The holly leaves and berries are our favorite. 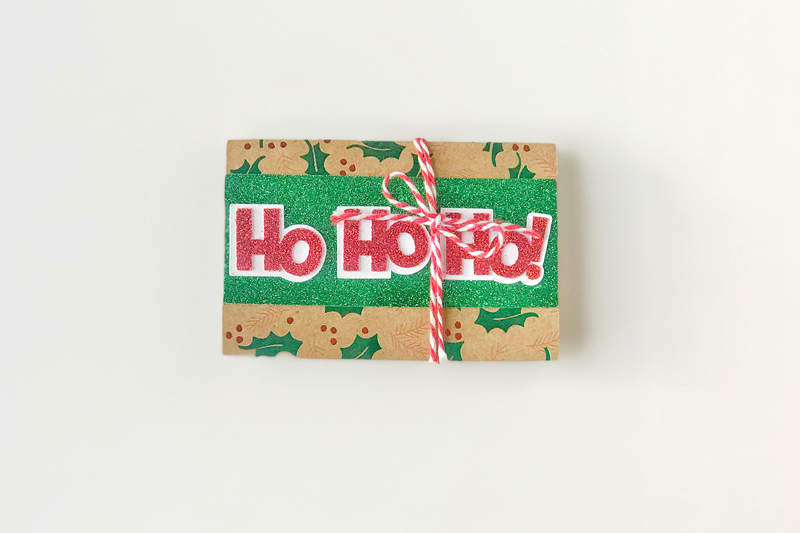 Adding layers of green and red glitter and white Kraftboard makes a perfect gift card envelope. The Art Glitter Glue made assembling the front of the envelope and card so simple. Tie shut with red/white baker’s twine. 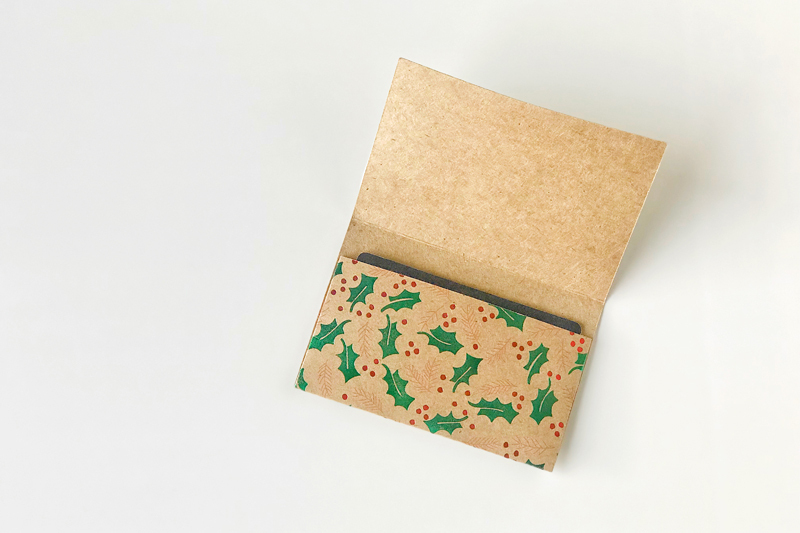 Another fun gift card envelope that holds a gift card perfectly. We’re using another piece of our Foil Embossed cardstock for this card, this time with silver trees and snowflakes. This design cuts the snowflakes out of the cardstock and we used green sparkle paper behind it for a fun pop of color along tying it closed with red/white baker’s twine. 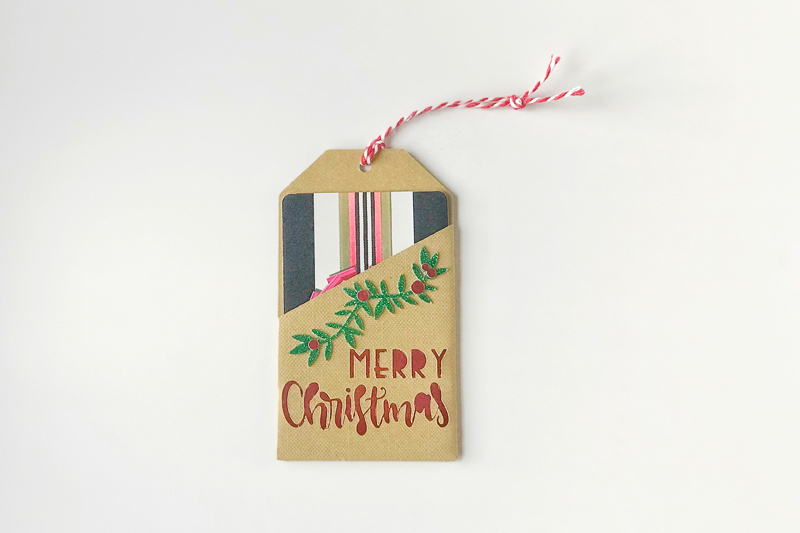 Turn your gift cards into a gift tag or even an ornament perfect for hanging on a tree. Be sure to tune in next week where I’ll be showing you ways to wrap up those homemade gifts!